The telescopic sight we put on a rifle and depend on so we can place our shot with the precision that open sights cannot provide is a potentially delicate thing. Rifle-scopes are made to be rugged and to survive not only the recoil of a heavy caliber rifle or pistol, but also to survive the knocks and sometimes drops that can occur. However, as I learned to my cost on one hunting trip, they are not indestructible, and if one is damaged or fails you can be reduced to using your open sights, if your rifle is fitted with them. Mine was, and the hunting trip was still a great experience, but I would have preferred to be able to use my rifle-scope rather than the iron sights. One of the times a rifle can be at risk of damage is when it is being transported, particularly if it is being transported on a commercial flight. We can pack our rifle complete with its rifle-scope in a solid hard case and make sure it’s padded well. However, as it disappears on the baggage carousel at check-in we lose control over how carefully it will be handled. I’ve had one rifle suffer a cracked stock in shipping, the crack being around the area where the pistol grip meets the action, and I’ve had a solid rifle case suffer a couple of broken corners though in that instance the rifle itself emerged unscathed. If you are embarking on an expensive hunting trip, perhaps a “once in a lifetime” trip that it has taken you time to save up for, then you will want to do as much as you can to ensure your rifle and rifle-scope arrive at your hunting destination intact and still zeroed. One strategy that I adopted was to use detachable rifle-scope mounts so that only the rifle itself would need to suffer the sometimes not so gentle ministrations of the baggage handlers, whilst I had the rifle-scope, or better still rifle-scopes, in my hand carry. Being able to have a main rifle-scope, and a backup, and to be able to keep them safe in your personal care is a valuable thing to be able to do. The way I accomplished this was by using EAW mounts from Germany. My first set of EAW mounts came fitted to a Mannlicher-Schoenauer rifle I purchased from the Steyr Distributor in the UK. I had ordered the rifle ex-factory to be fitted with the standard Steyr detachable mounts but it was delivered with EAW mounts, and once I’d learned how to “drive” them I quickly began to appreciate them. The claim that with EAW mounts the rifle-scope can be removed and replaced and still remain zeroed proved to be true on all the rifles I have used them on. Top rifle is a Mannlicher-Schoenauer M72 rifle. Below it is a Steyr Mannlicher of the same period. The secret to achieving this detach-ability with reliable return to zero is achieved by the use of a conventional dovetail foot mounted on the front ring and base assembly, and a unique V block that snaps in between two cams mounted in the rear assembly. As the rear ring which has the V block in its base is inserted into the rear foot it rotates a spring actuated cam which then snaps shut providing a double wedge effect that positively locates the assembly in the same place every time. The only potential downside of this design is that it puts a twisting/torsional strain on the rifle-scope tube. 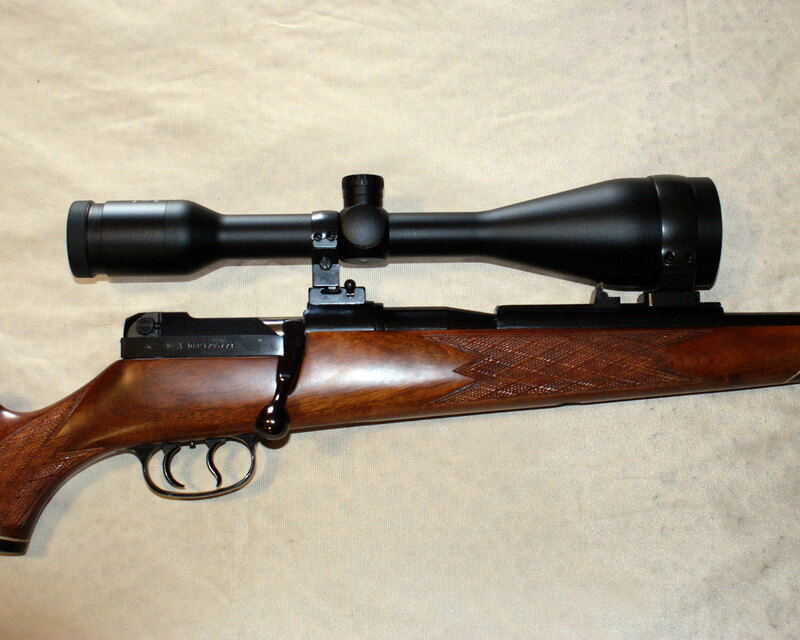 European rifle-scopes are made with one piece tubes so that torsional strain is of no consequence. However, the first rifle-scope I attempted to mount on the Mannlicher-Schoenauer in it’s EAW mounts was a good quality American one of a well known brand which had a composite tube which fitted into the adjustment turret. So the front section and rear sections of the scope tube were separate and held together by the adjustment turret. At home the scope seemed to mount OK and it was not until my first visit to the range to zero the rifle that the problem reared its ugly head. As I began to fire my first five shot group from a benchrest I noticed that the shots were not just not grouping but were flying wildly all over the target. It took a few shots before I realized what was going on. I noticed the small sprung latch on the rear EAW mount was moving from shot to shot, but the scope was tight in the rings. Examination revealed the unexpected, that the front and rear scope tube sections were twisting in the adjustment turret. So I went out and bought a Kahles rifle-scope with a one piece tube and that instantly solved the problem. The rifle started shooting between 0.5 to 0.7MOA groups and I was a happy camper again. When you fit a rifle-scope in a set of EAW mounts there are some things to be aware of in addition to avoiding a rifle-scope with a composite tube, especially if you are mounting the scope on a magnum caliber rifle as I was. My personal preference is for Schmidt and Bender, Swarovski, Kahles or Zeiss scopes. The top rings of EAW mounts are over center so it is necessary to use a couple of small screwdrivers inserted into the screw holes of the ring to use as levers to expand it gently so it can be fitted over the scope. The EAW top rings are quite springy so this is not as delicate an operation as it sounds, easier than using chopsticks for the first time. Especially for magnum calibers EAW recommend the use of the smallest smear of epoxy glue in the top and bottom rings to ensure absolutely no chance of movement. The rings for standard calibers have two grooves to catch any excess glue whilst rings for magnum calibers have a few grooves so you can use the tiniest bit more. The fit between the rings and the scope tube is very close so if your smear of epoxy is on the high end of “smallest amount” you may have glue being pressed out from between the ring and tube. I recommend that you don’t use five minute epoxy, use standard set epoxy so you have time to adjust things and clear up any glue that squeezes out from between the ring and scope tube before it sets. The final adjustments that may be needed, and that may need periodic maintenance is the adjustment of the tension of the dovetail of the front foot, and the adjustment of the cams in the rear foot. EAW provide good and clear instructions on how to fit their mounts so read them and make sure you understand them first. Epoxy glue is also used when fitting the bases to the action and for the front base must only be used on one area so the front foot adjustment is able to work properly. None of this is rocket science and the end result of having rock solid dependable mounts that enable you to remove your rifle-scope, or even interchange rifle-scopes on your rifle, is well worth it. Remember also to use a little Loctite on the screw threads of the screws attaching the bases to the action and the screws that secure the rings. If you want to have interchangeable rifle-scopes , so as to enable you to have a back up rifle-scope, or to have two rifle-scopes zeroed for different loadings, you need to ensure that EAW make you a matched set of rings so the fitting tolerances are the same. A set I had them make for me were flawless. In his book “African Rifles and Cartridges” John Taylor suggests that the ideal caliber for the “world wide one rifle hunter” would be the .375 Holland and Holland Magnum. Nowadays I’d be buying a Winchester Model 70 “Safari Express” or “Alaskan” in 375 H&H Magnum and fitting it with EAW mounts with main and back up rifle-scopes from Kahles, most likely a 2.5-10×50 Helia C and a 1.6-8x42i Helia 5. You will find the Kahles catalog here. 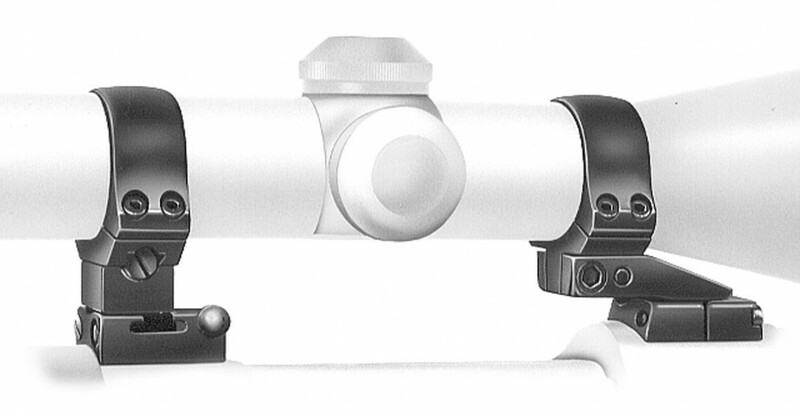 Though you might prefer a rifle-scope from Zeiss or Swarovski. Winchester Model 70 Alaskan. All that’s missing are the EAW mounts and the Kahles rifle-scope.